Revolutionise the way you interact with the world around you with the power of thermal imaging just a touch away. 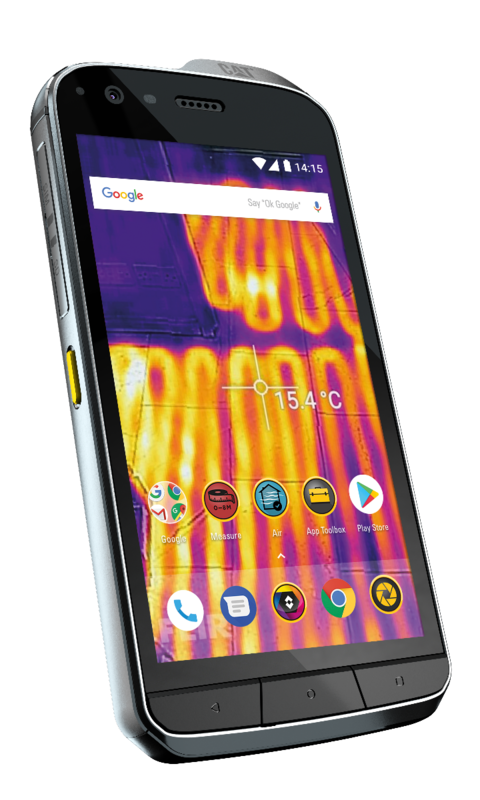 Be among the first to bring this accessible thermal imaging technology to your workplace; on-site or on-the-go with the Cat® S61. 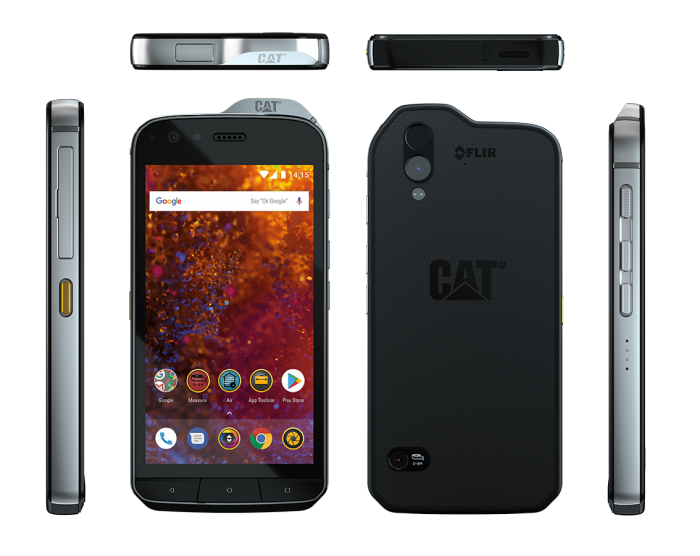 The integrated FLIR® thermal imaging camera on the Cat S61 smartphone can be used to monitor and diagnose problems more quickly and save time on-site. It provides a new perspective and opens up new use possibilities for the user, including detecting heat loss around windows and doors; spotting moisture and missing insulation; identifying over-heating electrical appliances and circuitry; seeing in complete darkness or through obscurants like smoke. 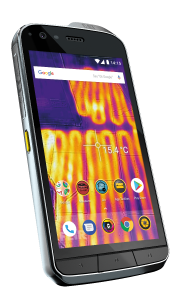 With Point-to-point measuring of up to 8 metres, the Measure app on the Cat® S61 uses the device’s in-built laser and rear camera to establish depth and calculate distances. It can be used to measure the distance from the device to a surface and to estimate areas on that same surface. The Measure app helps you to capture images on site that can then be used later to estimate sizes and dimensions. It’s a convenient way to take on-the-job measurement estimates, without a tape measure. You can use the Measure app on the Cat S61 to measure distances with a tolerance of up to +/- 3%. The app can be set to show either metric (metres and centimetres) or imperial (feet and inches) units of measure. Measurement estimates are made using the device’s inbuilt laser and rear camera, so images are captured when measurements are taken. You can revisit a measurement taken earlier, and even take further measurements of the scene. The handy Air app measures the quality of the air you are working in when indoors. It will alert you to unhealthy levels of indoor air pollutants, like paints and solvents, and provides temperature and humidity readings. 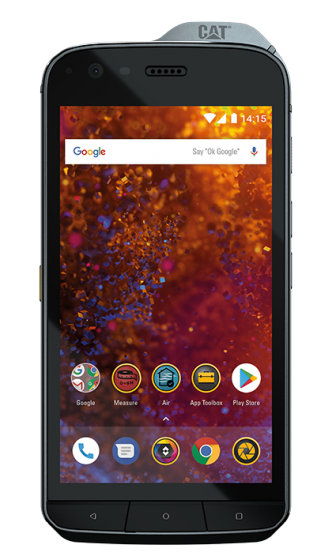 The world’s most water-resistant smartphone boasts an IP68 Rating (up to 3m for 1 hour). 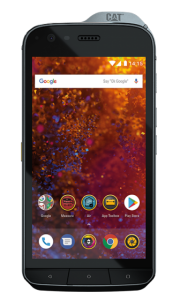 The S61 can also take underwater photographs and video, as well as having a glove and wet-finger compatible Corning® Gorilla® Glass 5 touchscreen. 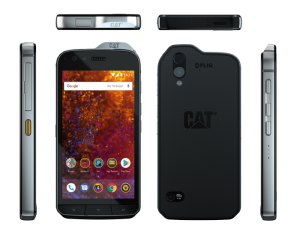 Shock resistant and reinforced with a strengthened Aluminium die-cast frame, the Cat® S61 exceeds even military specifications, making it the perfect companion to those living even the most rugged of lifestyles.